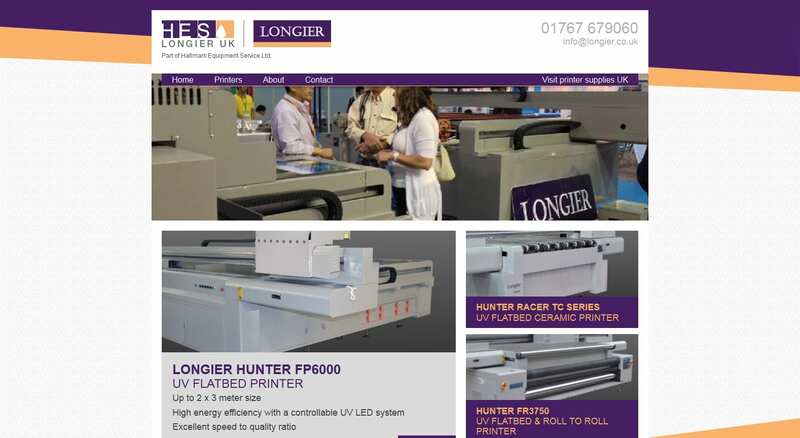 I’ve been working with ‘Hallmark Equipment Service‘ to design and develop a site for ‘Longier UK’ the UK and Ireland distributor for Longier large format digital printers. We launched the site earlier this week. It needed to be be clearly recognisable as a Longier site and branded accordingly, while still incorporating Hallmark’s ‘HES’ logo and ‘Longier UK’ but without modifying the existing Longier logo in any way. I ended up doing a HES/Longier UK logo using the Longier colours and placed the Longier logo alongside in the header. I’ve been given the tour of various print facilities and there’s always loads of movement and noise, mechanical stuff going on everywhere. If it’s just reams of paper rolling through the printers or folding machines making up brochures, or laser guided guillotines trimming edges (actually pretty awesome), the places are a hive of activity. I wanted to bring in some of that industrial printer movement into the site some how, and thought I’d try out some kind of parallax scrolling effect. For a traditional corporate, “header, footer, content, sidebar” style layout I’m pretty happy with it and there’s loads of clever WordPress stuff going on in the background to make content management really easy too. Easy content management, happy client.